We can see that the inter-enterprise re-structuring is happening to fit the new economy and the changing paradigm. The roles and responsibilities for the players are evolving. 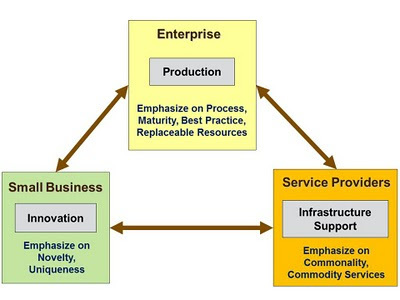 The focuses for good-sized enterprises are more on productivity, process-driven, maturity, and industrialization with replaceable components and resources, while the tasks of innovation are moving to small companies that will likely be acquired by large companies when getting matured. The infrastructure service is forming and separating from enterprise business, becoming a business of itself to provide common commodity services. The Inter-Enterprise Architecture (IEA) is helpful in providing such description for businesses, both large and small, to have a clearer picture for effective business propositions and game plans. IEA is helpful in being aware of business context, environment, mutual dependencies, collaboration and partnership opportunities.